Sugar processing is extremely sensitive to moisture content. Regulating the moisture content during the drying process optimizes production for best quality. If the final product moisture is too high, this can give rise to problems such as screen blockages, bridging in the storage silos and shelf–life issues. It is essential to sugar manufactures that the moisture content is controlled throughout the process as well as a final test is made prior to shipping. The IR3000 On–Line Moisture Sensor is accurate to laboratory standards with the added benefit of making a continuous measurement over the flow of product at critical locations in the process, both at intermediate and final moisture levels. Fast and accurate moisture measurement is crucial for control of sugar production plants and for the safe storage and transportation of the final product. At each factory, sugarcane or beets, are washed and sliced into thin strips. Theses strips go through a large tank where raw sugar juice is extracted. The strips are gently lifted from the bottom to the top of the tank as hot water washes over them absorbing the sugar. After the sugar–laden raw juice is drawn off, the cane pulp is left behind. This pulp is processed separately and formed into pellets for livestock feed and other products. This pelletizing is the first of a few locations throughout the processing that requires an On–line MoistTech sensor. This juice is filtered and boiled under vacuum where much of the water is evaporated, forming a molasses. During this step crystals begin to form. Clean hot water is used to wash the sugar, producing pure white sugar crystals. The damp crystals are dried with filtered air in a rotating drum granulator and the dried sugar passes over screens which separate the various sizes of sugar crystals. 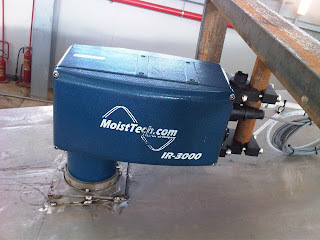 At this location, a MoistTech IR3000 Senor can be mounted over a moving belt as the varying sizes of sugar are conveyed to storage or packaging. In a typical line for production of cube sugar, the sugar crystals are moistened in a screw conveyor by adding 2-3% moisture. This moist sugar is fed to a mold for heating allowing the moisture to dry binding the crystals together. The amount of water or steam added is crucial to the process and pressing. Optimal moisture content of white sugar is typically between 0.02% to 0.05% and of raw sugar between 0.25%-1%. 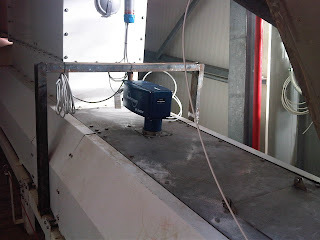 Additionally, after the final dryer a final moisture test is imperative in the sugar production process as the moisture levels need to be less that 0.1% to avoid storage problems in storage silos. Pneumatic conveying is a popular method of moving dry sugar through pipelines using air to control explosive dust. Using the MoistTech Pneumatic sampler system dust control systems can be properly designed monitoring moisture levels to ensure free flow of product and prevent explosive hazards.